WELCOME TO MY MONEY MISSION ONLINE: I WON IN HIP2SAVE SOCKGRAM GIVEAWAY! WA-HOO! I WON IN HIP2SAVE SOCKGRAM GIVEAWAY! WA-HOO! I am just a teeny bit excited! 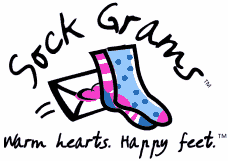 I just checked my emails this morning and found out that I was one of the winners in the Hip 2 Save Sock Gram Giveaway! How Awesome!! What? You don't know what sock grams are? They are the perfect cozy greeting for that special someone… and ordering is as easy as 1-2-3! Shop socks or cards by recipient, occasion, or sock patterns. Pick a card and add your personal message. They add free foot balm (or stickers for the kids), gift wrap and have it delivered right to their mailbox. Right now, they are also offering FREE STANDARD SHIPPING on all orders to the United States!!! For my choice of sock, I chose this ADORABLE gardening sock. Congrats, it always fun to win something!! I'm going to hop on over and check out the Cool Garden Socks! Have a great day!